Here in the Washington D.C. metropolitan sprawl, we will enjoy 14 hours and 54 minutes of daylight today, the longest of the year. It is officially summer. The long days are great. The heat, humidity, haze, and afternoon thunderstorms are already here. Anything above 6 miles of visibility will be a luxury until fall. 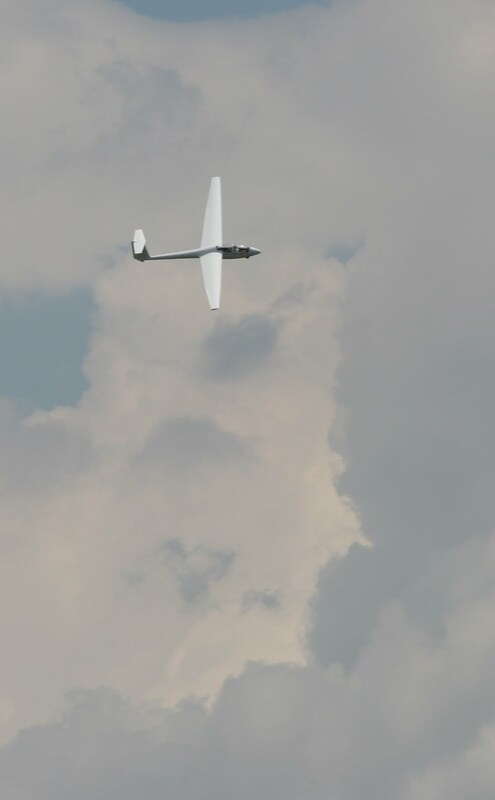 I went glider flying on Friday, Saturday, and Sunday of this past weekend, racking up a total of 11 short solo flights in the SGS 1-36 Sprite. The conditions on Friday were sporty with a nearly direct crosswind from the southwest. The turbulence off of the tree line tossed the 1-36 around enough during takeoff that I hit my head (lightly) on the canopy on the third flight of the day. Now I really cinch down the straps of the 4-point harness, starting with the lap belt. On all of my prior flights I began the 45-degree traffic pattern entry at 1,500 feet AGL about 1 nautical mile from the airport. In the Sprite, I needed full dive brakes each time to get the sailplane down to 1,000 feet above the ground at midfield on the downwind leg. On Friday, I decided to postpone the pattern entry until 200 feet lower, thinking I could extend my flight by a minute rather than wasting the altitude with the air brakes. Poor choice. The instructor later explained that what felt like strong sink on downwind was actually wind shear. I held the dive brakes completely closed until the final approach, which helped, but the glider was still 200-250 feet lower than usual abeam the touchdown point. I was ready to abbreviate my pattern at any moment and land on the runway rather than the shorter adjacent grass patch. The sight picture looked surprisingly different, and it did not feel good to be low. I managed to get back on the glide path by the final approach, though, and the landing was uneventful. In retrospect, I should have flown the pattern at least 5 mph faster than usual based on the conditions. While I had plenty of altitude margin to make a safe approach even if the sink was much stronger, it still got my attention. Go-arounds aren't an option in a glider. The instructor was correct when he said that flying around--and scaring myself--in a single seater would teach me more at this point than bashing around with a CFI. This lesson certainly wouldn't have been driven home as strongly if I had an instructor in the back that I knew could help me out of a jam.